Note: as it was originally written for Flixchatter, this review is formatted differently than most of my work. 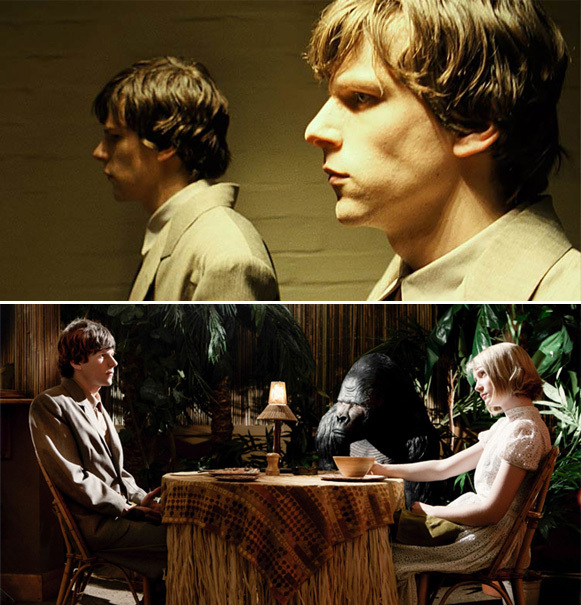 The Double follows Simon James (Jesse Eisenberg, who plays against type and is award-worthy superb), a meek man unrecognizable to his co-workers, one of whom is the girl of his dreams, Hannah (Mia Wasikowska, terrific). Early in the film, Simon’s bleak life takes two unhappy turns. First, he witnesses a suicide, and then his doppelgänger, James Simon (also Eisenberg, this time playing to type), begins working at the same company, doing a similar job. James is more likable and confident than Simon, meaning he is more successful, despite being less qualified. 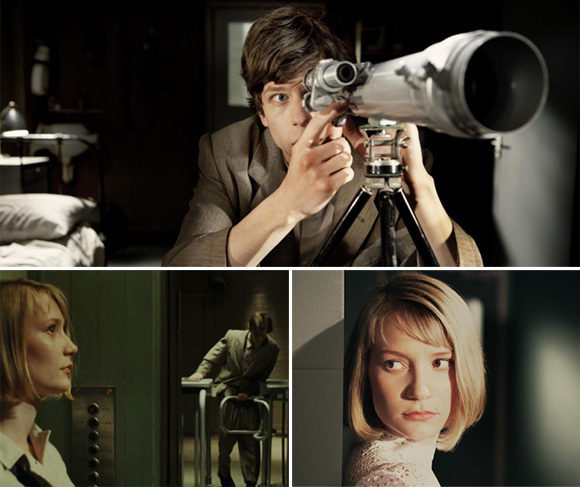 Writer/director Richard Ayoade’s film isn’t exactly scary, and might not even qualify as creepy. Nor is it commonly laugh out loud funny or emotionally impacting. Plus, it is at least somewhat derivative, obviously resembling Brazil (1985), amongst other movies. At times, as when Simon says things like, ‘But I used to exist. I mean I exist. I’m standing right here,’ it is even reminiscent of Wes Anderson’s best work. By rights, then, The Double, should fail to register, should fade from memory, should be just another conceptually interesting science fiction movie unable to maximize its potential. Thankfully, it is more than that, owing mostly to Ayoade’s fantastic production design. The film’s thematic and narrative content is dark, and so is The Double’s color palette. Here we see mostly browns and grays, with some whites mixed in; the retro computers; the televisions; the characters’ costumes; interior and exterior doors; most walls; tables; desks; and so forth. Because much of the imagery is borderline dull, the few times we see bright color (consider James’ unbuttoned Hawaiian shirt), we know something significant will soon happen. Or, at the very least, that the image is meaningful to Simon. The movie’s retro technology and set pieces are as effective as its color palette. From the box televisions, to the copy machines with dial controls, to the small screen computers, the technology helps solidify The Double’s setting and enhance its atmosphere. Its set pieces do the same: apartments are very small, and bigger rooms are mostly filled by complicated piping connected to aforementioned machines. Before long we begin to understand Simon’s world, to feel his claustrophobia and lack of entertainment, not to mention his social disconnectedness. Ayoade, in other words, effectively immerses us in Simon’s reality, thereby making us care about the character and causing dread when the protagonist’s life goes horribly wrong. It doesn’t matter, in other words, that the director keeps us at psychological and emotional distance from Simon. We empathize with the character anyway. Which is why The Double is thematically resonant and intellectually intriguing, the sort of movie that will keep viewers thinking, even days after seeing it. What does this picture say about an individuals’ place in society? About confidence? Identity? Relationships? And more? Thematic power is not The Double’s only strength. The cast is terrific. Moreover, the central characters are developed well, and Ayoade and co-writer Avi Korine’s dialogue is witty. Finally, the film is funny enough to always entertain. Simply put, The Double is very good. You probably know that I can’t stand Eisenberg at all. Do you think I would like this? If you can in with an open mind, yes. If you will be blind the film’s merits, because of Eisenberg . . . no. Honestly, I think he’s Oscar good here. So if you can have an open mind, this flick might even convince you not to hate him anymore. It is. But you should try it . . . it’s a pretty thrilling flick. And the production design is exquisite. I like him too. And he’s great here. I think he’s award worthy awesome, actually. I read about this film a lot when it came out recently. Great review dude which I will come back to when I see it. I think you’ll like it a lot. A great atmosphere, excellent performances, witty dialogue and interesting characters … Seems like your sort of flick (and mine). Eisenberg can act for sure. I saw him years ago when the film Roger Dodger came out. Awesome film. And Campbell Scott’s performance was a masterclass. It certainly was. ’02 was a very good year for Scott – I believe Secret Lives of Dentist was released late that year (maybe early ’03). Either way, he was great there, too. I’d forgotten that Eisenberg is in Rodger Dodger. But you’re right that he is very good in it. Great review! I’m looking forward to seeing this one a lot; I liked Submarine and Mia is a great young actress. Shame it doesn’t get a “proper” cinematic release here (it does in Austraila, just not in my city); I have to wait like a month for a delayed release. There are some people who really like Brazil but are less fond of this one than me. Their consensus, it seems, is that it is too reminiscent. I don’t entirely agree – I think there quite a bit more going on here. Lovely review! Glad you liked it. 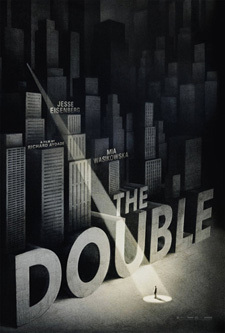 I thought The Double was an excellent film with a lot of interesting themes. Eisenberg was terrific. Good review, and I like Jesse Eisenberg, so will have to keep an eye out for it. Thanks. He’s really excellent here. I don’t think you’ll be disappointed.